Photo: Jordan-Williams House, ca. 1855, Rocky Fork Road, Nolensville, TN. Listed on the National Register of Historic Places in 1988. Photographed by User:Skye Marthaler (own work), 2013, [cc-by-3.0 (creativecommons.org/licenses/by/3.0)], via Wikimedia Commons, accessed March, 2014. Williamson County administrative offices are located at 1320 West Main Street, Franklin TN 37064; phone: 615-790-5700. Williamson County was created in 1799 with the county seat situated at Franklin. Other early communities included Nolensville, Bethesda and College Grove. Many large plantations were established in the county with cotton, corn, wheat and tobacco all produced in abundance. The rich black loam of the county supported large scale agricultural methods based on slave labor and fine brick and frame homes were built throughout the county in the early 19th century. By 1850, the population of the county was just over 27,000 which included approximately 13,000 black slaves. By the mid-19th century Williamson County was characterized by hundreds of large and small farms with the majority of commercial and social activity centered on the county seat of Franklin. In the rural areas of the county a number of crossroads communities arose which generally contained mills, blacksmith shops and general stores. Towns such as Nolensville, College Grove, Triune and Lieper's Fork were centers for area farmers who shopped or brought goods to mills. None of these communities ever rivaled Franklin for prominence in the county and the largest of them such as Triune and Nolensville did not have over 100 residents during this period. The appearance of the county before the Civil War was one of forested hills and cultivated rolling hills and valleys. The county contained thousands of acres of cotton, wheat, tobacco and corn as well as grazing lands for cattle and sheep. The county was crisscrossed by a series of public and private roads such as the Wilson Turnpike, Nolensville Pike, Lewisburg Pike and Carter's Creek Pike. In 1860 the Tennessee and Alabama Railroad was completed through the county. This new mode of transportation influenced the growth and development of communities along the railroad such as Thompson's Station and Brentwood. The Civil War brought extensive devastation to the county. The county's ample agricultural supplies made it of strategic importance to both Union and Confederate armies. Fought over constantly during the war, the county's plantations were repeatedly ransacked with crops confiscated, fences and outbuildings destroyed and in some cases homes burned. Many homes sheltered wounded and sick soldiers during the war years. The county was the site of major engagements at Triune, Thompson's Station, Nolensville and Brentwood as well as the Battle of Franklin fought on November 30, 1864 (The site of the Franklin Battle was designated a National Historic Landmark in 1966). 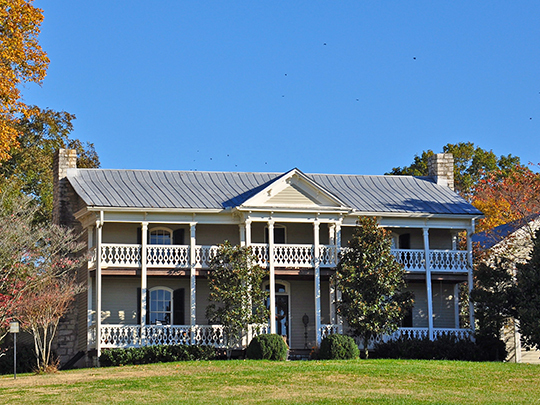 Some of the finest residential architecture in Williamson County was constructed between 1830 and 1860. The development of the ante-bellum plantations resulted in many fine frame and brick homes erected in these years. Frame and brick residences constructed in Williamson County from 1830 to 1860 followed designs common in the upper South. Common details include central passage plan arrangements, classical features such as dentils and modillions, Doric influenced columns and symmetrical floor plans. Both the one and two-story residences built by the wealthier farmers of the county often reflected the popular Greek Revival style. The Greek Revival style was the primary influence in the square and round columned porticos which were built on the more pretentious houses of the period. The most common house form of the period were one and two-story frame I-Houses of three or five bays in width. Almost all were built in central hall designs with rear wings in ell or "T" plans. On the main facades are central entrances with Greek Revival influenced transoms, sidelights and surrounds. Another feature are one and two-story gable porticos with square or round Doric columns. This type of house form is very common in Williamson County although many have been altered or remodeled in the 20th century. After the Civil War most of the large and ornate residential and commercial buildings were constructed in Franklin. A number of fine Italianate and Second Empire style residences and stores were constructed around the town square from 1865 until 1900. Only a few large Italianate residences were built in the rural areas of the county in these years. The majority of historic structures which survive in Williamson County are frame buildings constructed between 1875 and 1910 in rural areas of the county and in the Franklin historic districts. Most of these fit into several categories of building plans and forms and are generally unpretentious interpretations of the styles of the period. Thomason, Philip and Matter, Mary, Williamson County Tennessee Multiple Resource Area (MRA), nomination document, 1988, National Park Service, National Register of Historic Places, Washington, D.C.